At the start Yuki Bhambri was off by a tad. He was hitting net chords, missing the chalk, picking the wrong line. He was rushing, not taking his time. A toilet break, following the first set, at the end of which he looked to be coming back, appeared to get him going. 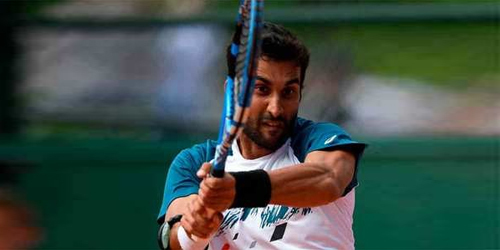 The Indian took a 4-2 lead in the second set of his French Open first-round clash against Belgium’s Ruben Bemelmans. The former junior world no.1 then reached for the accelerator only to find he didn’t quite have the next level. The 25-year-old came apart disappointingly midway through the second set, losing nine straight games to the 111th-ranked lucky loser, who then served out the match to clinch his first main draw win at Roland Garros. Bemelmans, who had failed to make it through the qualifiers of the of the French Open for eight years, scored a 6-4, 6-4, 6-1 win in 2 hours and 10 minutes. The India No.1, who littered the court with 45 unforced errors, hitting 32 winners failed to control his opponent’s forehand, from which flank alone the Belgian had 22 winners. Bemelmans, who has made the round of 32 at the US Open and then again at Wimbledon in 2016, used his greater number of matches on clay coming into the second Grand Slam of the year, to his advantage. Bhambri, who arrived in Paris a week ago, said he was feeling more comfortable with every practice, but found out there was no substitute to match practice. Bhambri and Sharan will play the latter’s former partner Mumbaikar Purav Raja and Frenchman Fabrice Martin in the first round. In a first round men’s doubles encounter 13th seeds India’s Rohan Bopanna and Edouard Roger Vasselin of France scored a 6-3, 6-1 win over Americans Taylor Fritz and Francis Tiafoe.